Jewelry Safes New York | Check Cashing Safes Long Island: Accu-Safes Inc.
TL-15 safes successfully resist entry for a net working time of 15 minutes when attacked with ordinary hand tools, picking tools, mechanical or portable electric tools, grinding points, carbide drills and pressure applying devices. TL-30 safes possess the same properties except that net working time is 30 minutes. TL-30x6 safes are the same as TL-30s except the resistance properties apply to all six sides of the safe. TRTL-15x6 safes are resistant to tools and torches on all six sides. The net working time before a side is breached is 15 minutes. TRTL-30x6 safes have the same features as TRTL-15x6 except the net working time is 30 minutes. TRTL-60x6 safes take two times longer to breach than TRTL-30x6 safes. 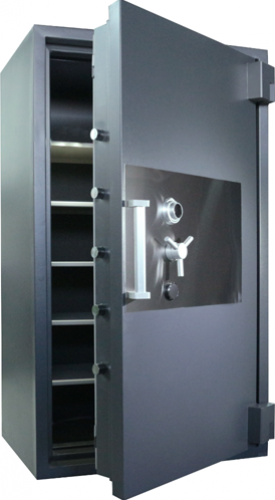 Because of their high resistance to entry, safes bearing the ratings above are ideal commercial safes for keeping merchandise, cash, and/or important documents from burglary and fires.